Why choose Malware Expert Commercial ModSecurity Rules ? Home » general » Why choose Malware Expert Commercial ModSecurity Rules ? No matter how well a web server is configured, it is useless if it’s not properly secured. It’s a famous saying, ‘a chain is as strong as its weakest link’. As a system admin you have to address all vulnerabilities of your server. Since one single untreated vulnerability will be exploited by an attacker and results will be disastrous. We may say, ‘a web server is as strong as its weakest vulnerability that can be exploited’. Businesses today are widely dependent on web sites and other web application than ever before and down time of few minutes means loss in revenue. If you are providing hosting services, make sure your web servers are secure against all latest threats and have 100% uptime. Web Application Firewall or WAF is great tool to filter HTTP traffic coming in and out of your web server. One of popular and open source WAF is ModSecurity, you can deploy it to secure your Apache, Microsoft IIS and Nginx Web Servers. Firewalls whether hardware or software need rules and same holds true for ModSecurity. Although ModSecurity comes with predefined rules that can also give protection but to achieve 100% security you need something extra. Malware Expert Rules for ModSecurity are developed to give almost 100% protection against Malwares, Botnet and other latest attacks. They are robust and industrially proven secure to give best security to applications running on Apache, Nginx and Linux servers. Malware Expert Rules for ModSecurity are trained and matured over a period of over ten years, starting from 2005. These rules were developed after analysis of real traffic that’s hitting websites and are capable enough to protect your web servers, while allowing you to focus on other business activities. The great thing about using Malware Expert ModSecurity rules is that you can enjoy this extra security with zero degradation to performance of application running on your web server. If you web server is fully configured with best response rate and you are looking for something to secure it, than Malware Experts rules for ModSecurity are for you. All you need to achieve high security for your web server is to install ModSecurity firewall, configure it with Malware Expert rules and that’s it. Another reason why to choose ModSecurity rules from Malware Expert is it gives almost 100% security to your content management systems like WordPress, Joomla and Drupal from latest malwares and viruses. Malware Expert ModSecurity rules provide advanced security and intrusion protection for PHP applications. They guard your servers against following attacks. In nutshell, Malware Expert ModSecurity rules enhance the performance of your Web Application Firewall (WAF) by implementing its ModSecurity rule sets. Install our rules and then you can take relax. 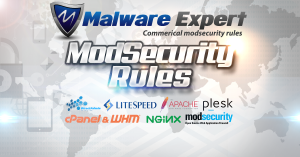 If you haven’t tried Malware Expert ModSecurity rules you are already too late.